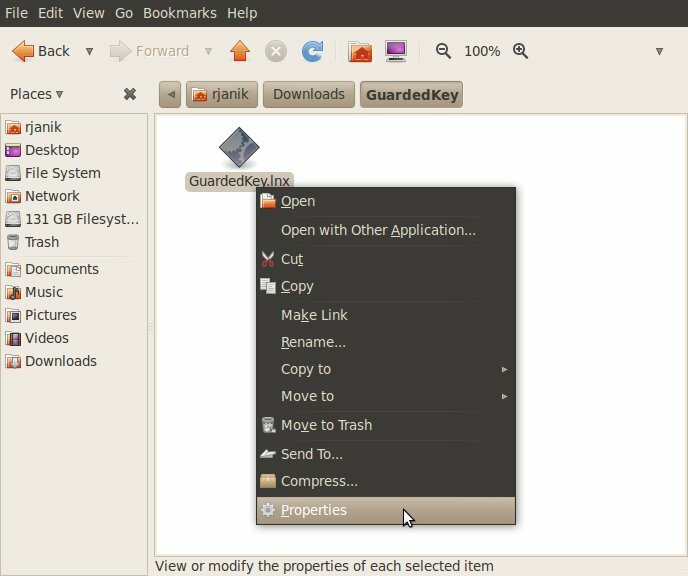 Guarded Key executable file for Linux is available for download as GuardedKey.lnx binary or GuardedKey.tar.gz compressed file, which contains lnx binary. Note: Extension "lnx" was chosen to distinguish Linux binary from executable files for other platforms. 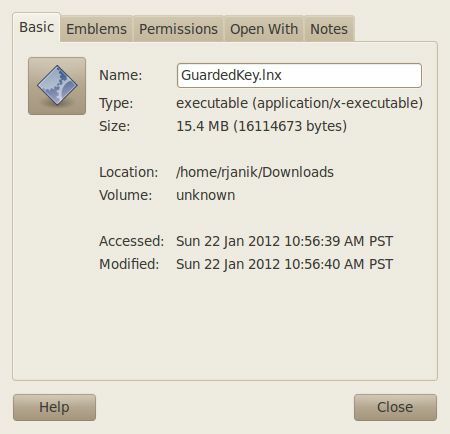 Download GuardedKey.tar.gz and extract executable file. From file manager right click tar.gz file and in context menu select "Extract Here". 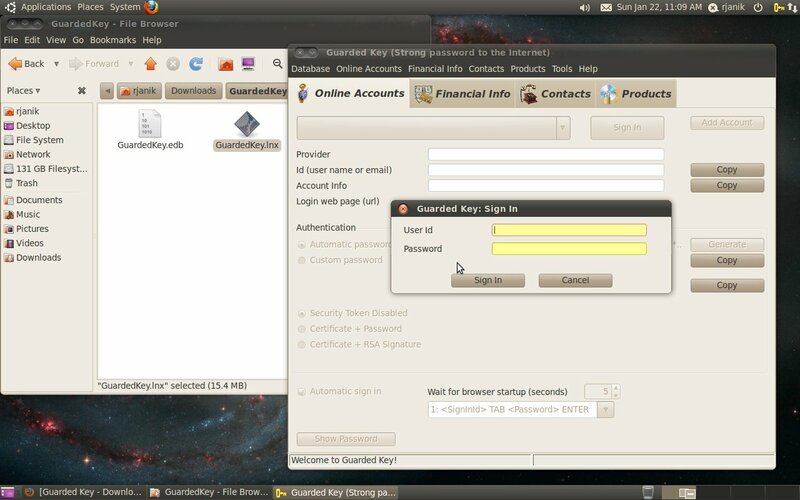 If you extract GuardedKey.lnx executable file on Windows and then copy to your Linux computer, it will lose attribute "Executable" and you will be unable to start the application. You can fix it using steps below. 1. Download GuardedKey.tar.gz and extract executable file - see steps above. In file manager right-click GuardedKey.lnx file and from context menu select "Properties". Select tab "Permissions" and check "Allow executing file as program" checkbox. 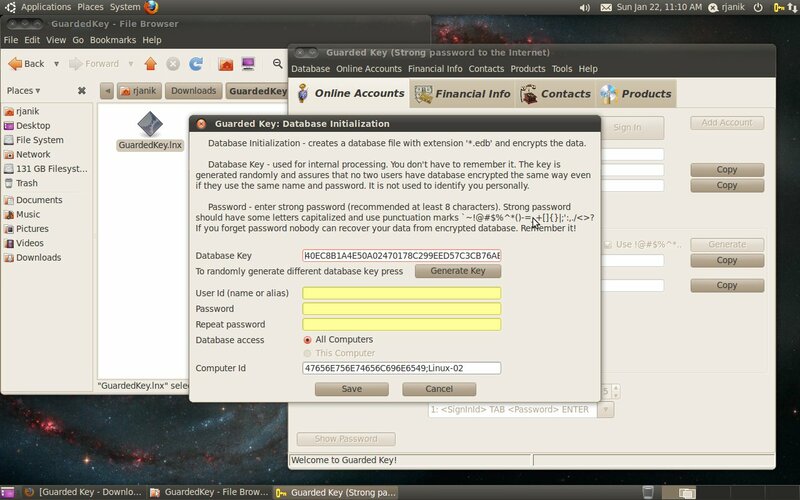 If you are moving from another computer or platform, copy your existing GuardedKey.edb file (encrypted database which holds your data and registration code) to the same location where you just installed the application, otherwise the app will display dialog “Database Initialization”. When your GuardedKey.edb file is in place, start the application and sign in. If you decide to move the application to another location or USB drive, you need to move both the executable file and your data into the same folder. This has advantage for users who run Guarded Key from USB drive on multiple computers or different operating systems. All executable files are stored in the same place as the database and that means that your database is always up to date even if you move from one computer to another. No data synchronization is necessary (despite that you should backup your data regularly in case you lose your USB drive). You can create your Portable password manager on USB flash drive or memory card using these steps.